We’ve got a thing for Danielle Poffenbarger, otherwise known as Danielle Poff… this darling photographer captured our GWSxMumu dresses last year and we’ve featured a number of weddings + styled shoots that she’s been a part of… including her own wedding, seen here! 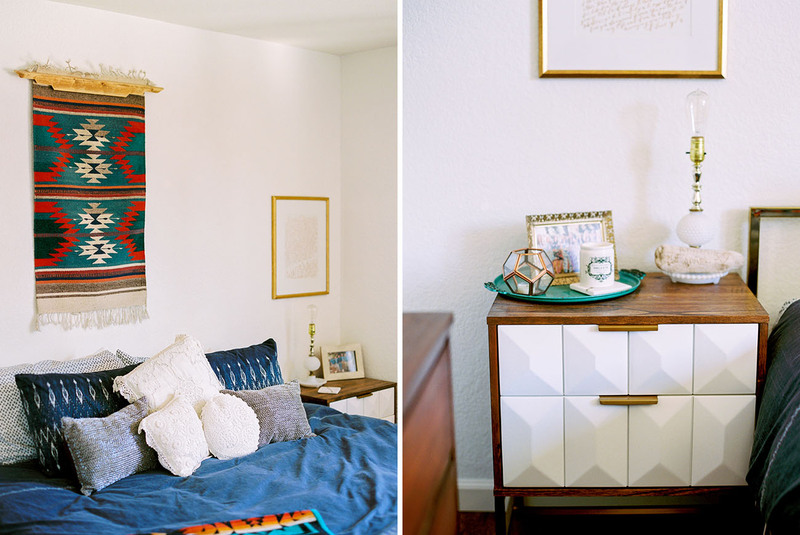 So, when she sent over photos for a home tour of their adorably named, “Poff Pad”, which features a mix of mid-century modern designs, antiques, and boho-inspired touches, we were giddy with joy! Danielle shares a little about combining their two styles: Luckily, we actually have similar taste when it comes to design. 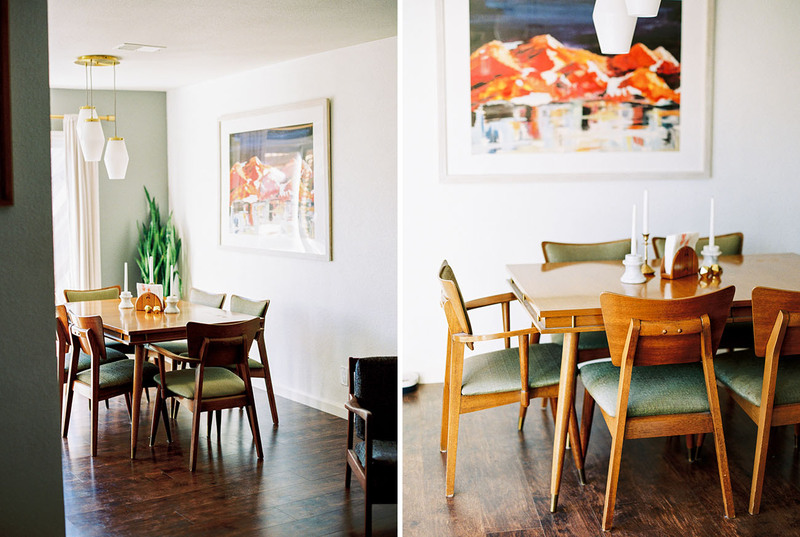 We both love the mid-century modern look, cool neutral toned walls, colorful decor, and a mix of old and new for the finishing touches. We like have sentimental pieces in our house, like the items used at our wedding and the milk glass lamps in our room from Adam’s family. For the exterior, we like modern and clean lines, so again, it was easy to agree on the design elements for all of that too. Ready to be inspired? 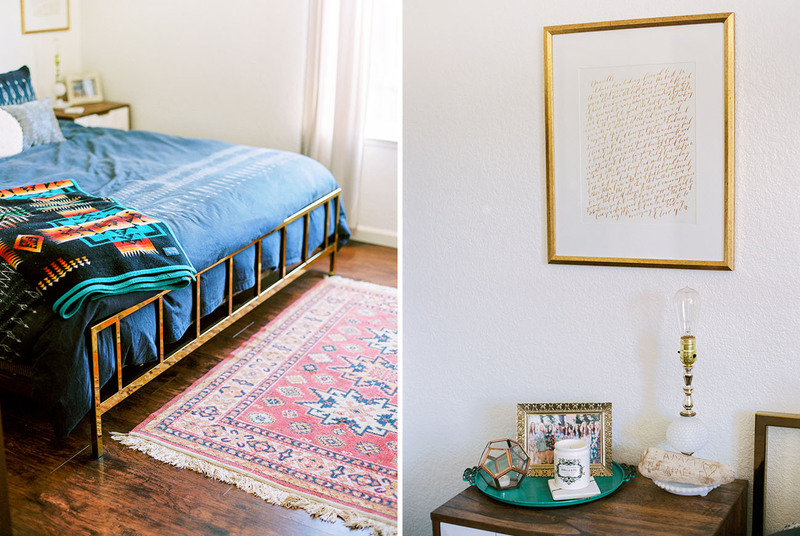 Let’s take a tour of the “Poff Pad” with photos by both Danielle Poff Photography + Jessica Burke. 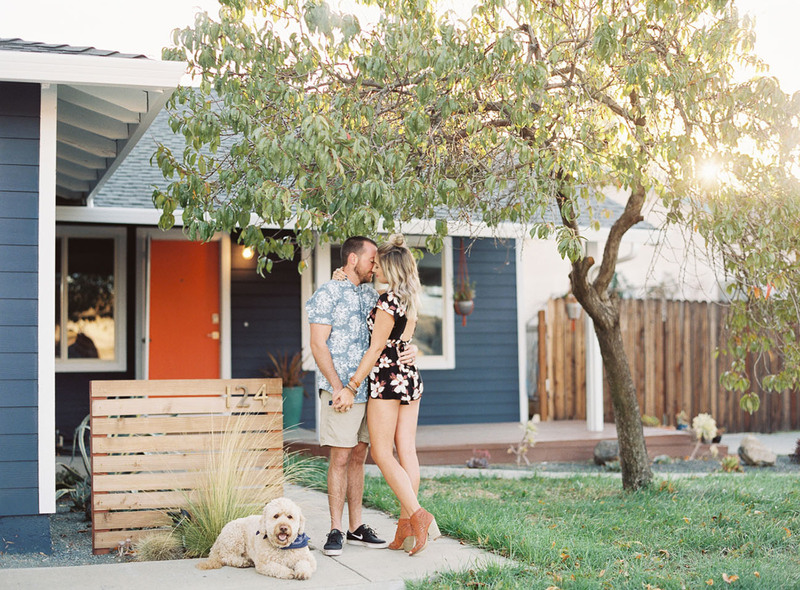 We have been together since senior year of high school, moved down to San Luis Obispo together and attended Cal Poly, and then moved back to the Bay Area and bought our first house! We really love designing and building, and since we didn’t manage to get a fixer upper this time around, we still had plans to make this place our own. 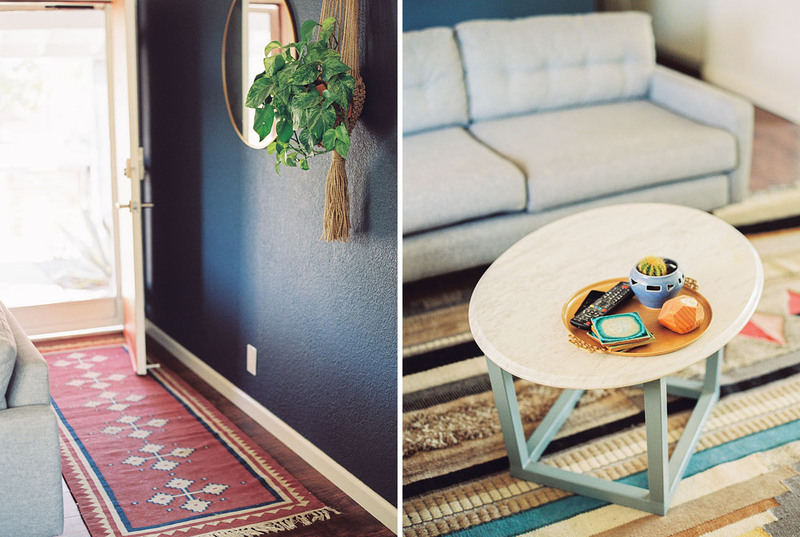 One of my favorite DIY projects that we did together was the coffee table for our living room. Since the space is a bit tight, we needed a curved coffee table and I wanted marble. I searched Craigslist and found this amazing coffee table (with ugly legs) for $90, and Adam welded new legs and we painted it a gray color. 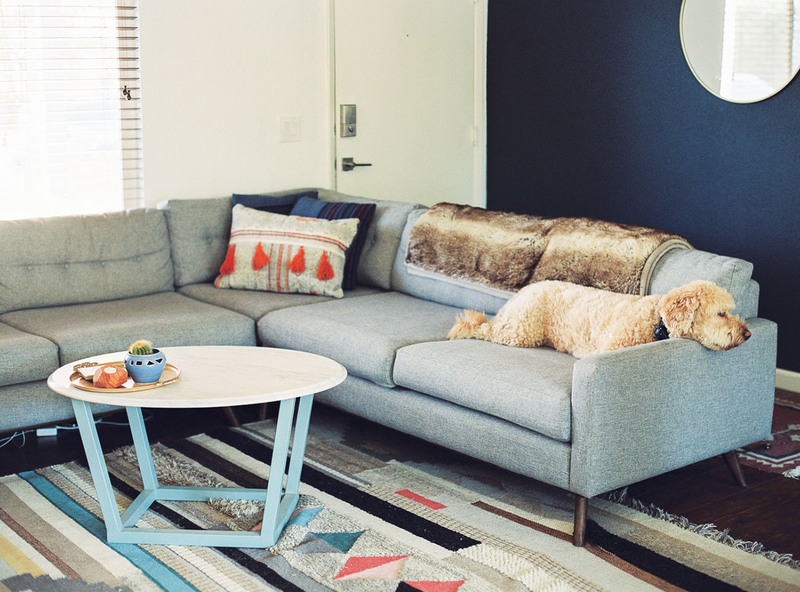 Oh and that awesome couch that their pup is cozied up on? It’s by Joybird. And, fun fact, Danielle + Adam actually bought the couch three months before moving in and one of the stipulations when house searching was finding one that fit this couch! Being photographers/videographers ourselves, the majority of our artwork in our house is photography. We used travel landscape photos as most of our art. 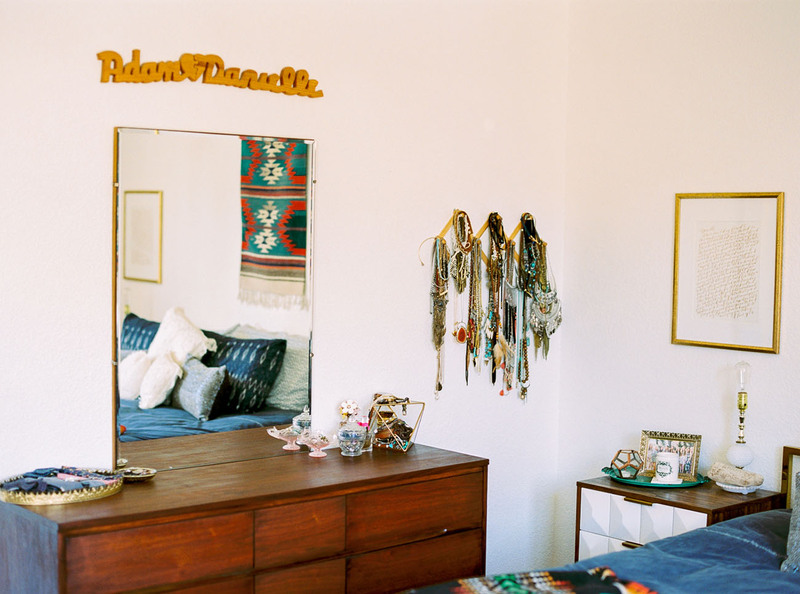 The dreamcatcher on the wall is one of many dreamcatchers that D+A had made for their wedding. Some of the decor sitting on the sideboard were pieces on the reception tables, too! 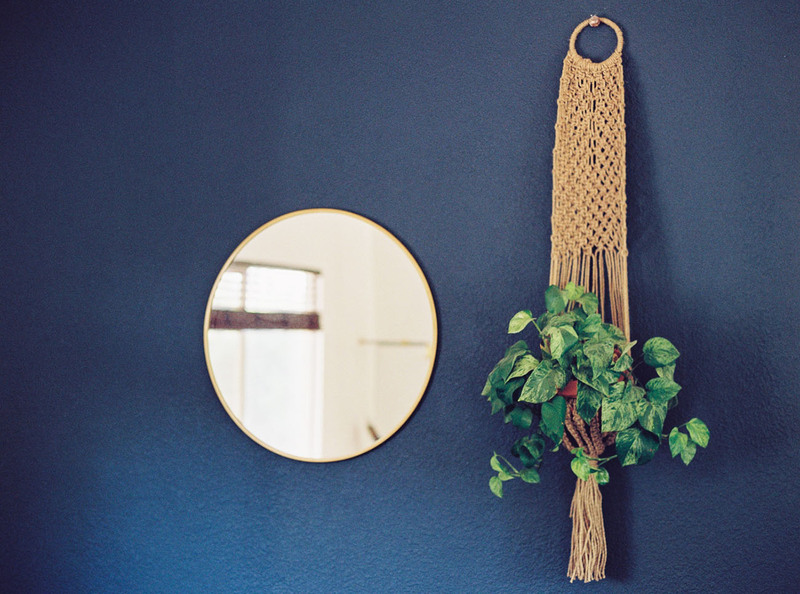 I really love our dark blue wall. When we first moved in, the whole house (inside & out), was painted tan. I knew I wanted a dark accent wall since the rest of the house was mainly white. We were deciding between dark blue or black, and I’m really happy we went with the color we did. 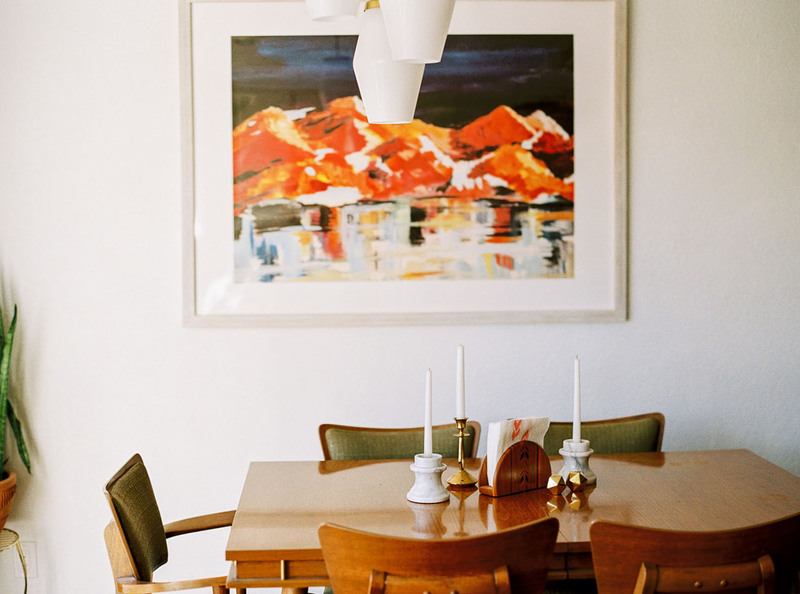 The mountain photo behind their kitchen table is from Minted. Most of the little details in our bedroom have meaning. Hung above our nightstands are our personal wedding vows, which Rosey Calligraphy did for us. 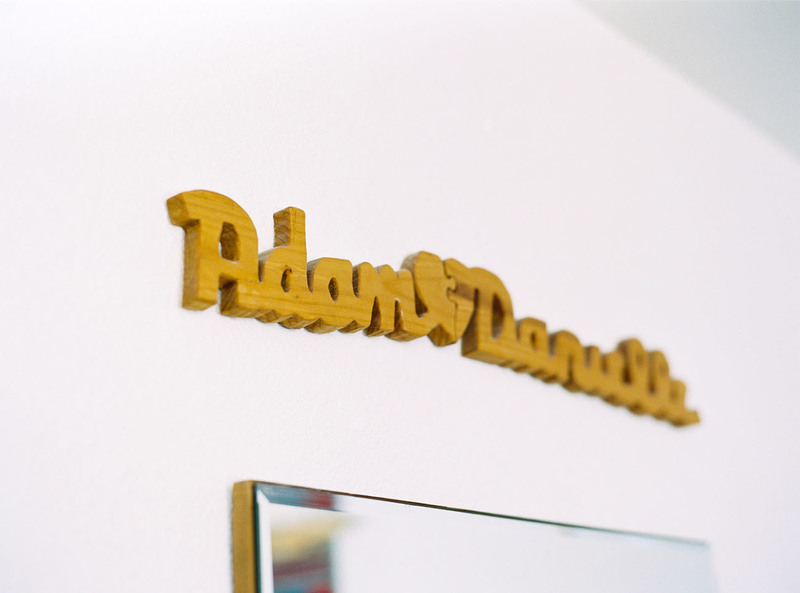 Adam made the Adam <3 Danielle sign in the first year we were dating (10 years ago!) and we used it at our head table at our wedding, and I’ve always hung it in each house we’ve lived in. That super cool nightstand is from Target (Nate Berkus). 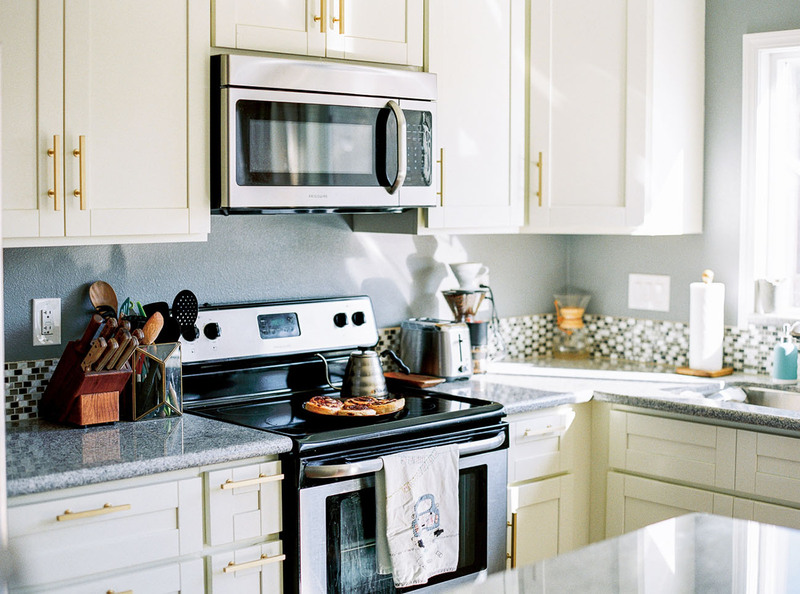 What’s your advice for couples currently designing their home? I think it’s important to be true to your own style and not try to conform to what’s cool. 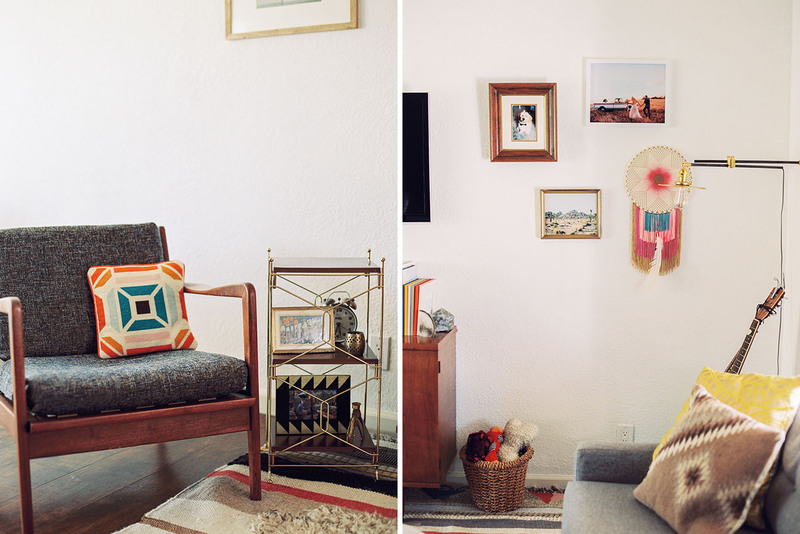 I really love the look of a clean, neutral looking room, but when we bought an ivory rug, I knew that just wasn’t us. We returned it for a colorful rug and it just felt right. We can’t deny our love of color! How did you collect/manage the inspiration for the design? 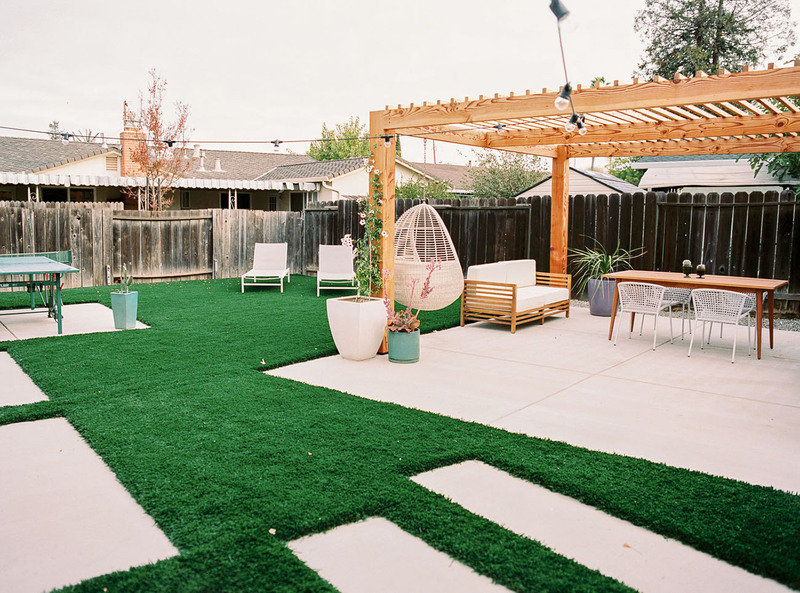 Pinterest was the main source for the exterior of our house and backyard, because we would have an idea in mind, search it, and then Pin it directly to a board. The interior of our house we just did what we liked, hung items that were special to us, and filled in with some fun pieces that we found. 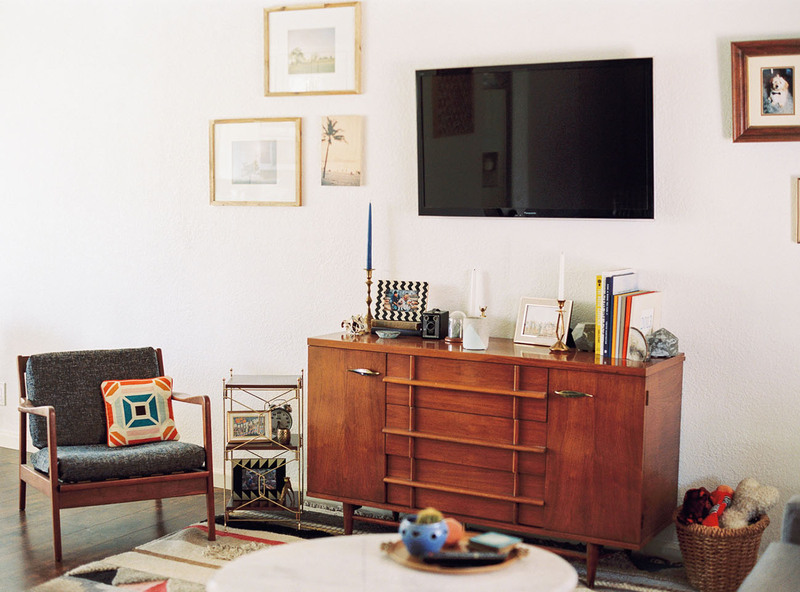 Love this space as much as us? 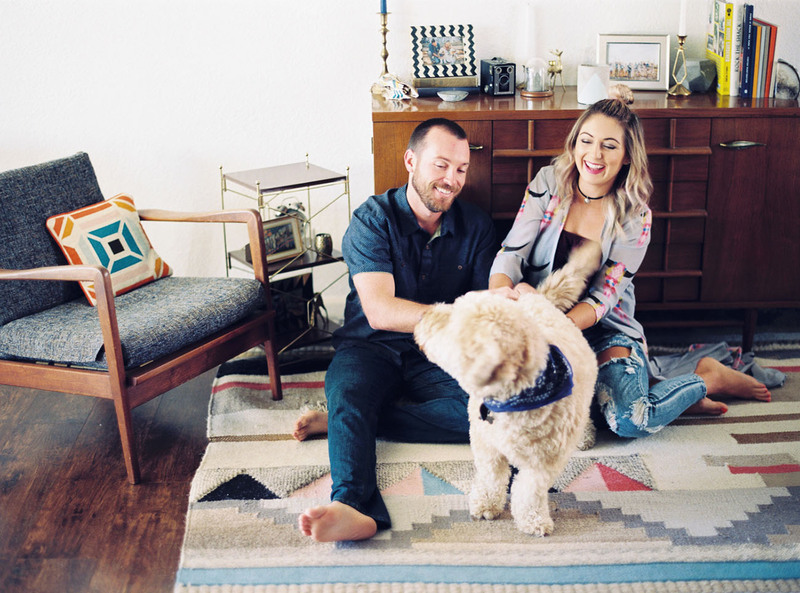 Good news — photographers/stylists can rent out Danielle + Adam’s house for photoshoots! Head on over here for more info. Sweet little touches everywhere! 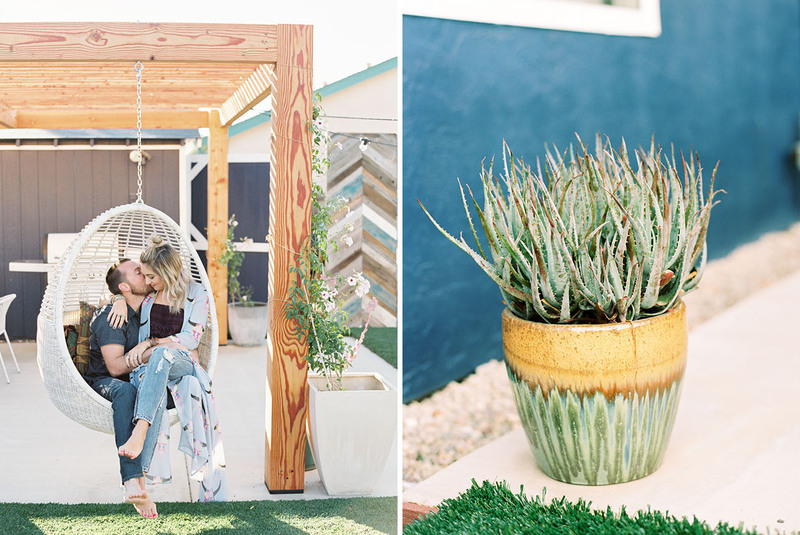 And if you checked out their wedding, you might recognize their ceremony backdrop (made by Adam) is now in their backyard! Love it you guys!! How did you two stay on budget and figure out when you should hire a pro? 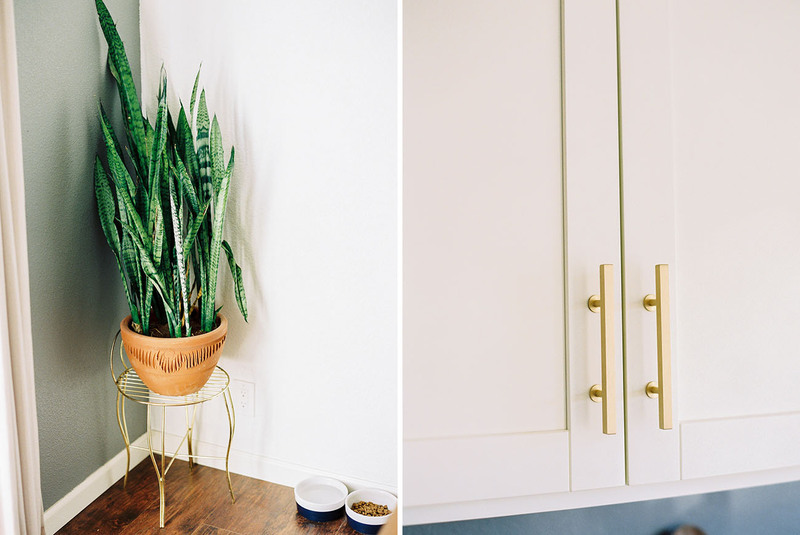 We looked on Craigslist for a lot of items — that’s where we found our coffee table top, our dresser, and where we found out about the antique sale that we bought our kitchen table set from. When it came to things that were larger scale, too time consuming, or too hard to learn, we decided it would be better to bring someone in. 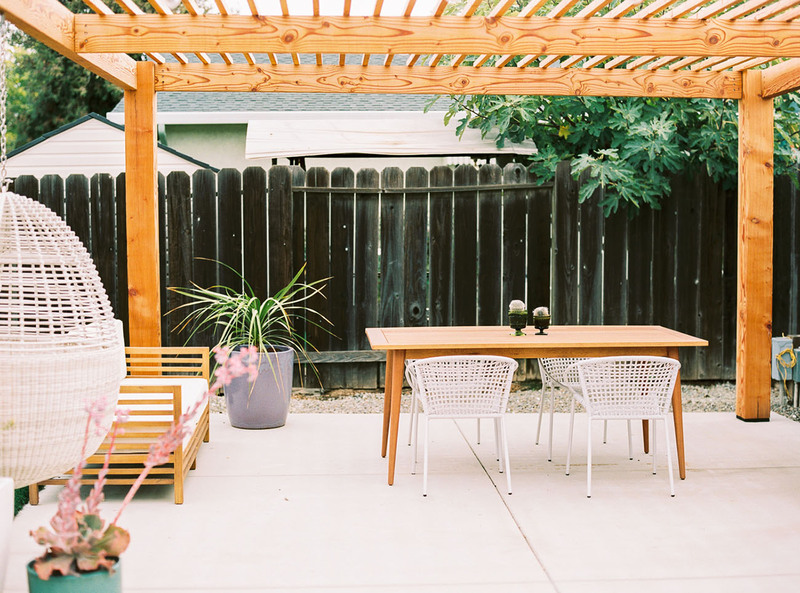 Adam redid the siding on the front of our house, built the pergola in our backyard, and together we designed the layout for our backyard. But because of time, we hired someone else to do all of the concrete work and to paint the exterior of our house. 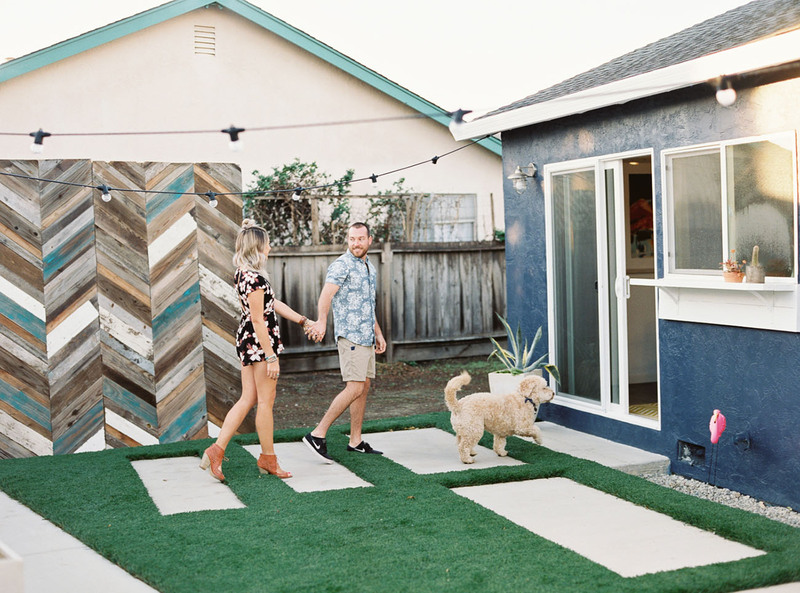 Thanks for inviting us into your home, Danielle + Adam! Can you tell me the colors on the exterior of your home? 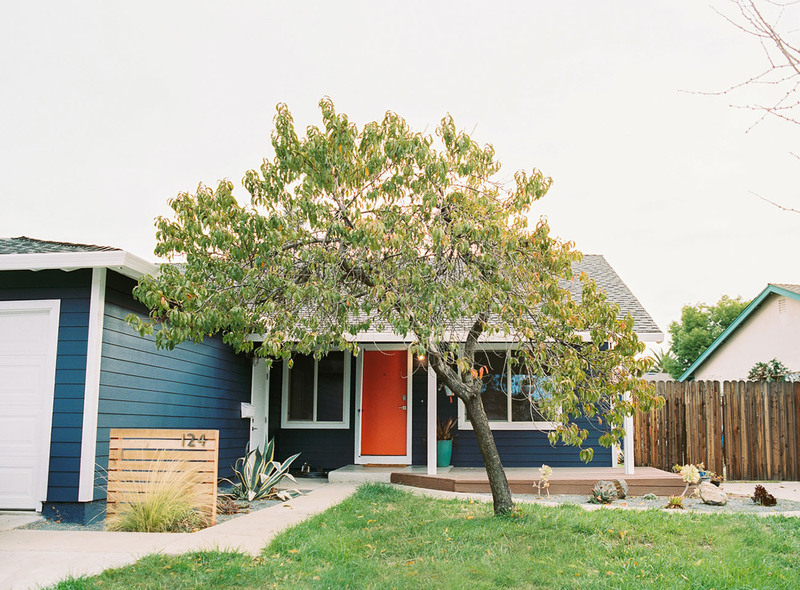 Love the blue with the orange door!!!! I would love to know the orange color on the front door as well!